Few days ago, I went to The Curiosity Shoppe with citrusboy and picked up some cute things I didn't think I needed. We were actually there on the opening day! I was so impressed with the decor that I swore to make a second visit on a more quiet day. 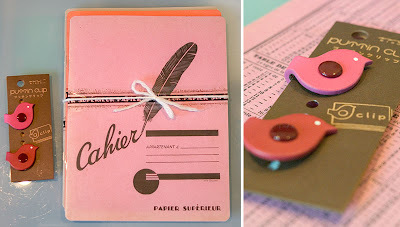 I got a set of three French reproduction notebooks from Laughing Elephant and a pair of cute birdie snap clips. I'm planning to use the notebooks as my business journal/notebooks. I didn't think I would get larger ones that the one I'm currently using but what can I say, I needed an excuse to get them. I have a thing for rounded corners..
For pictures of the shop, Grace of Design*Sponge uploaded a whole lot of them here. I feel so lucky to be living within walking distance of this place.. I'm sure I'll be there there again very soon.. Anyway, congrats to The Curiosity Shoppe on their store opening!